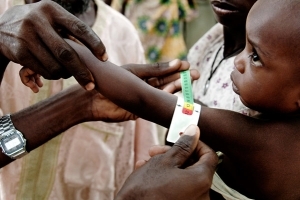 A child in Niger is measured for signs of acute malnutrition, a condition affecting one in ten children in the country. Photo by Martin Sprecht. “Niger has been hit extremely hard by the drought and the world has to act to prevent massive human suffering and the loss of a generation,” WFP Executive Director Josette Sheeran told Greater Voice. Weak and erratic rainfall across parts of the eastern Sahel had destroyed harvests and parched land used by pastoralist communities to graze livestock. And in January, results of a national survey found that more than half Niger’s population of 13.5 million is food insecure. The ramping up of WFP operations focuses on reducingmalnutrition through general food distributions to 1.5 million people. WFP is targeting small children in particular as malnutrition in the early years of life can compromise physical growth irreversibly. WFP says it’ll also target pregnant women and nursing mothers as well as supporting the provision of cereal banks – community cereal stores where women buy grain at subsidized prices at the height of the ‘lean season’ when the previous harvest has run out. Communities restock the banks during the next harvest when prices are lowest. WFP is working against time to provide food assistance as fast as possible, buying most of the needed food from neighboring countries to significantly shorten the lead time, which is normally about four months, to deliver food to Niger.